I had a great time at Joseph-Beth Booksellers in Lexington, Kentucky this past Saturday. 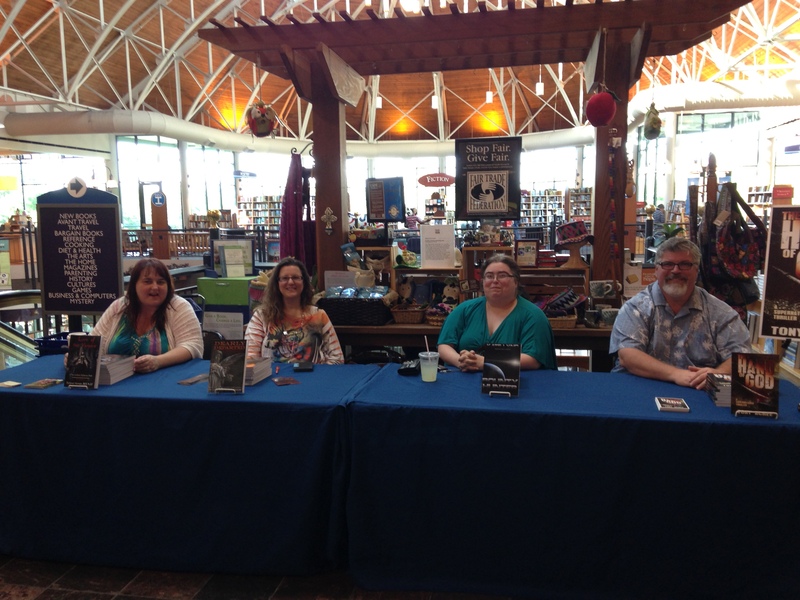 They hosted Hydra Publications for a book signing and myself along with authors Amy McCorkle, Rachael Lanham Rawlings and Bertena Varney all attended. I was there signing and selling copies of The Hand of God. They have a fantastic store and I wanted to add a special shout out to Michael, Ed and David for taking such great care of us. From making sure we never lacked for refreshments to announcing our visit regularly to their patrons, the whole event was first class. If you are an author, then you want to have a signing at Jo Beth. If you are a lover of great books in a friendly environment, then you want to spend the afternoon shopping at the store. You won’t leave empty handed. Add in they have a wonderful restaurant and a coffee bar, and you have everything you need for an enjoyable day browsing the shelves. The afternoon did have one odd adventure. A lady mall cop walked by our table and she looked my way. In my best southern gentleman drawl, I offered up a “Howdy Ma’am.” She shot me a look, eyes narrowed and kept walking, evidently not hearing what I said. When the other authors at the table laughed, the mall cop spun on her heel, her hand drifting to the gun on her hip. Except, there was no gun, but her hand hovered there by her side, twitching, as if trying to will the weapon into existence. I swallowed hard and said, “I just said howdy.” The other authors quickly backed up my contention and the mall cop slowly nodded her head once, relaxing the fingers of her gun hand and continued on her rounds. I took a deep breath and tried to relax. When the next woman walked by and glanced my way? Well. Lets just say no one tried to shoot me.